I’ve been working on design projects with the American Horticultural Society (http://ahs.org/) since 2006, thanks to an introduction to the organization by my dear friend and sage mentor (and employer many moons ago), Brian Loflin (http://www.loflin-images.com/). A few years ago, he taught a garden photography workshop for AHS at the Lady Bird Johnson Wildflower Center in Austin, Texas (http://www.wildflower.org/). 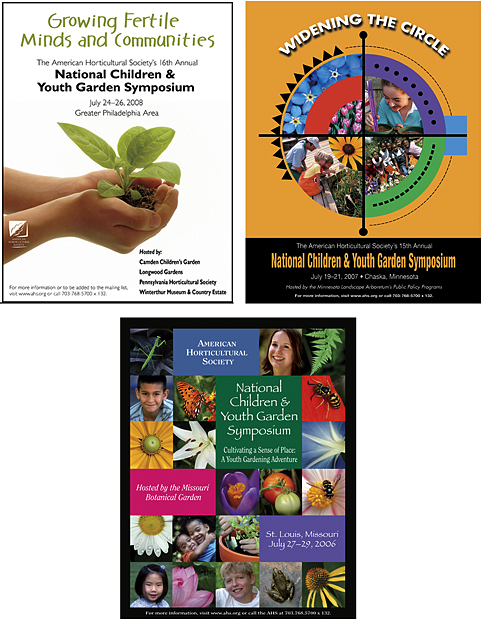 I’m on my third National Children & Youth Garden Symposium campaign this year (layouts below are 2008, 2007, and 2006 campaigns). Since my introduction to the organization, I’ve worked with several departments on invitation projects, AHS Garden School brochures, and the latest AHS member publication, Garden Clippings. I’m fortunate to be able to incorporate many of my garden images into various projects, too! © Cindy Dyer, Dyer Design. All rights reserved. 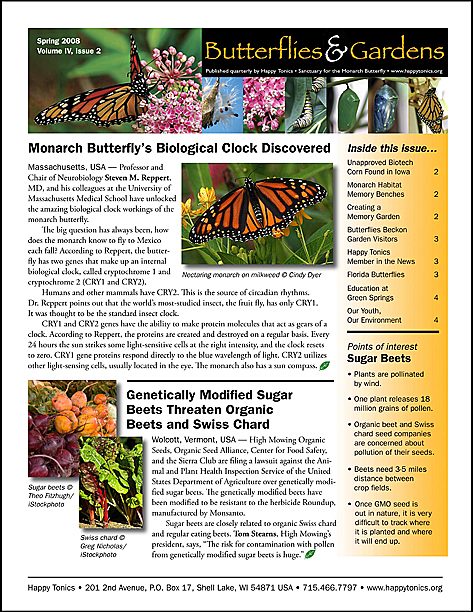 I just completed my second issue of the newly-redesigned “Butterflies & Gardens” quarterly newsletter for Happy Tonics. You can download the 4-page pdf file here: www.cindydyer.com/ButterfliesGardens2.pdf I design and produce all work for Happy Tonics on a volunteer basis. This issue has many of my photos as well as a few contributed by my friend, Jeff Evans. Jeff shot the last four images included in the banner on page 1 and also the monarch caterpillars shot on page 4. A little background on how I have become connected to Happy Tonics: a few years ago I purchased milkweed seeds on eBay from Mary Ellen and we became instant friends. I learned about her background and mission and decided to offer my design and photography services to her cause. I donated design and postcard printing costs for one project and have just completed this second issue (redesigned) of the publication. I’m also working on an organization logo and a plant identification poster. Mary Ellen and her organization, Happy Tonics, (http://www.happytonics.org/) have begun establishing a monarch butterfly and native plant sanctuary near Shell Lake, Wisconsin. 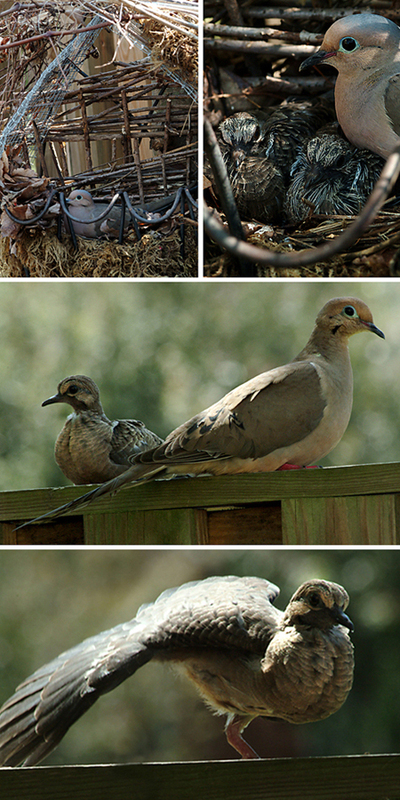 The client loves her new abode; see paparazzi’s photographic proof, attached, in the first photo below. © 2007 Cindy Dyer. All rights reserved. Below is an e-mail from my Dad on 3.31.2006, in reference to me wanting to use the occasional exclamation mark for emphasis in my letters (when I want to show excitement). Although I break his exclamation point ruling from the time to time, I should get a gold star for not overdoing it by putting !!! at the end of a sentence…that just shows too much excitement, in my humble opinion. One is enough for me. In the Grecian language eureka means, “I have found it,” and was said to have been uttered by the great Pythagoras on his invention of the 47th Problem of Euclid, a process of measuring distance through triangulation (the Pythagorean Theorem). The measurement process is also known as the Egyptian string trick, not to be confused, of course, with similar knotted items (strings of pearls, beads, anchor chains, etc.) referenced in the Kama Sutra, and in the works of the Marquis de Sade and others of his ilk). It is probable that Pythagoras did in fact exclaim “Eureka” on his discovery, and then he probably followed up with a passionate, even shouted, “Exclamation point.” The actual symbol used to punctuate an exclamation (!) was probably developed by a linguist (or linguists) at a later date. It’s well to note that anytime one exclaims, the exclamation may (but not necessarily must) be followed by an exclamation point. I am unsure as to which punctuation mark should follow an utterance—perhaps an exclamation begins life as an utterance, then progresses to an exclamation, thereby earning the right to an exclamation point. You may have already been familiar with Pythagoras and his theorem, but you may not be aware that Pythagoras, on his discovery of the 47th Problem of Euclid, is said to have celebrated and memoralized his momentous feat by sacrificing a hecatomb (100) of cattle. They must have had one hell of a barbeque! During my surprise (short!) visit to San Antonio this past weekend, a group of us went to Willie’s for an early dinner. As we were leaving, we met Len Little, a.k.a. 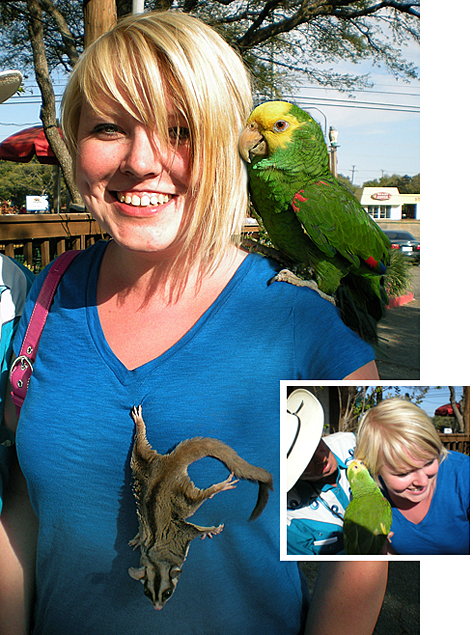 “The Birdman of San Antonio,” his parrot Polly (of course), and a sugar glider. Len is a bird trainer and provides entertainment for parties, day cares, and other organizations. (birdmanofsa@yahoo.com or 210.387.2510). Since I had three different cameras with me and knew I could get a decent shot, we offered up my niece Lauren (nicknamed Gigglebean by me in her toddler days) as the guinea pig for the Birdman’s tricks (thanks for being a good sport, girl!). She even let Polly hang from her earlobe and the sugar glider crawl up the front of her shirt. Anything for a good shot, I always say! A sugar glider is a small, nocturnal marsupial native to Australia and Indonesia. To learn more about these cute little critters, go to www.sugarglider.com or read all about them here: http://www.sugarglider.com/gliderpedia/index.asp?SugarGlider. After reading about the care, feeding, and specific needs of these exotic animals (as well as the downside to having them as pets), I don’t think I’ll be adding them to our menagerie any time soon! 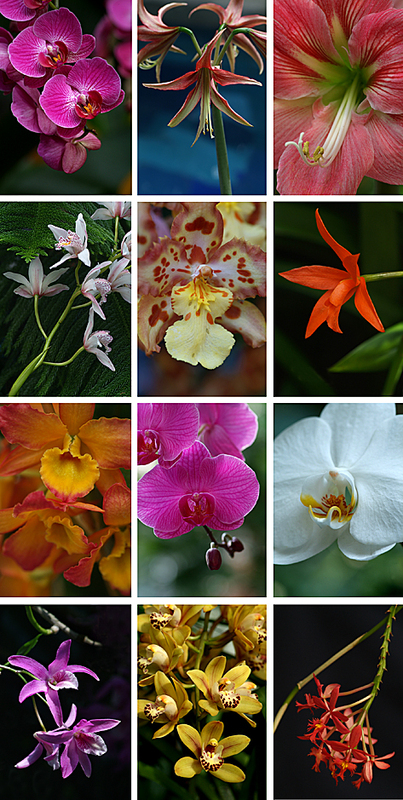 More shots from this year’s Orchid show at the U.S. Botanic Garden. My friend Carmen and I finally made it over to the U.S. Botanic Garden (http://www.usbg.gov/) this year. The exhibit at the entrance to the building is their first-ever textile exhibit, “A Stitch in Vine,” featuring beautiful botanically-themed quilts handmade by artists of the Chesapeake & Potomac Applique Guild (http://www.quiltguilds.com/maryland.htm). Also on display is their annual Orchid exhibit. 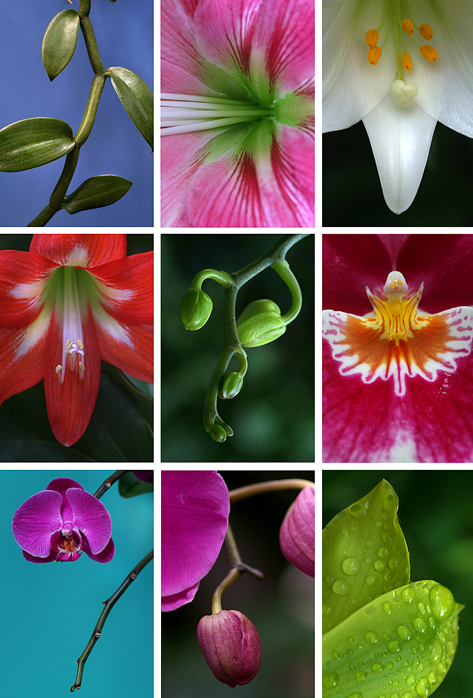 This year’s exhibit is “An Alphabet Garden of Orchids,” and remains on display through April 13. There seemed to be even more plants on display this year than last, so there were ample photo ops. These are just a few of the more graphic shots I got.